Veteran British promoter Frank Warren has lashed out at rival Eddie Hearn, labelling the offer from Anthony Joshua’s promoter to Tyson Fury as “ridiculous” and “derisory”. It comes after Hearn revealed on Monday that he had tabled an offer to Fury’s team for the self-styled ‘Gypsy King’ to face the WBA, IBF and WBO heavyweight champion at Wembley Stadium in London on April 13. Hearn also said that WBO number one contender Dillian Whyte, who is a stablemate of Joshua’s at Matchroom Sport, has also received a proposal, as has Fury’s old foe Deontay Wilder, who holds the WBC heavyweight championship. Warren dismissed talk of the offer when speaking to Gareth A Davies of talkSPORT. “I’ve never seen that. That offer’s never been sent to me and I’m his promoter,” said Warren. “He did send something to Tyson, but that was a derisory offer. 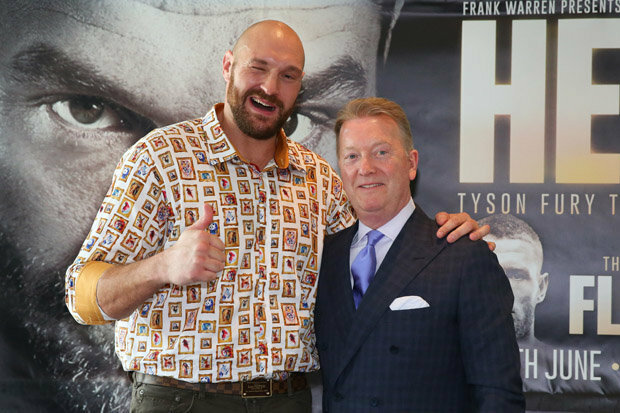 Hearn insisted the offer to Fury was not far away from a 60/40 revenue split with the larger slice of the pie allocated to the unified heavyweight champion. But Warren is standing firm on his demand for a 50/50 agreement if a fight with the lineal heavyweight champion is to be made. “There’s certainly no 60/40 offer to us, that’s rubbish,” Warren continued. “Where do they get the 60/40 from? Warren drew contrast with deal for then-WBO champion Joseph Parker of New Zealand to face Joshua in a unification bout last year. “When they did Parker, they settled on 67½/32½. You’re telling me that Tyson Fury’s worth [only] 7½% more than Parker? It’s ridiculous,” he said. Earlier this week Fury revealed he is considering a homecoming fight in Manchester in April before rematching Wilder in the United States in June.